What began as Kent Uyehara’s interest in skateboards has evolved into a global skate brand with outlets in San Francisco, Sacramento, Barcelona, and Tokyo. It was that very interest that led to him carrying boards at his dad’s sporting goods store, FTC (For the City), in 1986. Eventually, as the resulting interest in the shop grew and as SF attracted more and more skaters from across the world, Uyehara would collaborate with Aaron Meza and the crew to produce FTC’s game-changing first video that put them on the map, ‘Finally’. It’s those humble beginnings and the 20 years since the release of ‘Finally’ that are immortalized in this latest collaborative set of Dunks with Nike SB . 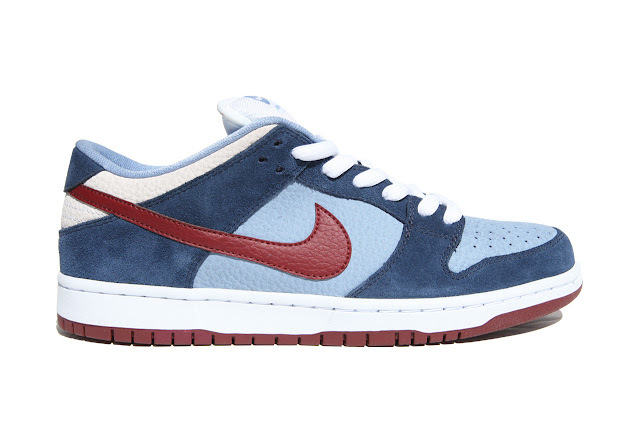 The “Finally” Dunk Low Pro features a retro-styled upper inspired by the colors of the video’s original cover art made possible by Del The Funky Homosapien of Hieroglyphics, an emerging young rapper at the time. Composed of both suede and textured leather overlays, graphics from this cover art are also featured embroidered on the back panels of the shoes. Those eager to secure a pair of the dunks can look forward to their release at FTC stores in April with later arrival at Nike SB’s Quick Strike accounts in May. The skate label also plans to release a special deck, t-shirt and DVD version of Finally as part of its anniversary celebration.